Background Lung cancer is the commonest cause of cancer in Scotland and is usually advanced at diagnosis. Median time between symptom onset and consultation is 14 weeks, so an intervention to prompt earlier presentation could support earlier diagnosis and enable curative treatment in more cases. Aim To develop and optimise an intervention to reduce the time between onset and first consultation with symptoms that might indicate lung cancer. Design and setting Iterative development of complex healthcare intervention according to the MRC Framework conducted in Northeast Scotland. Method The study produced a complex intervention to promote early presentation of lung cancer symptoms. An expert multidisciplinary group developed the first draft of the intervention based on theory and existing evidence. This was refined following focus groups with health professionals and high-risk patients. Results First draft intervention components included: information communicated persuasively, demonstrations of early consultation and its benefits, behaviour change techniques, and involvement of spouses/partners. Focus groups identified patient engagement, achieving behavioural change, and conflict at the patient–general practice interface as challenges and measures were incorporated to tackle these. Final intervention delivery included a detailed self-help manual and extended consultation with a trained research nurse at which specific action plans were devised. Conclusion The study has developed an intervention that appeals to patients and health professionals and has theoretical potential for benefit. Now it requires evaluation. In a recent study it was found that nearly all 360 participants newly diagnosed with lung cancer had experienced symptoms prior to diagnosis, and that the median time between onset of symptoms and consultation was 99 days (interquartile range [IQR] 31–381).10 Current UK guidelines recommend referral for investigation after 3 weeks of symptoms, so this study suggests there is potential for more than 75% of patients to be referred earlier if they consulted earlier.11–13 While this ‘perfect’ consulting behaviour may not be achievable, an intervention aiming to reduce the time taken to consult with chest symptoms would appear to be desirable, timely, and consistent with current health policy initiatives in the UK.14 This article describes the development and optimisation of an intervention to reduce the time between onset and first consultation with symptoms that might indicate lung cancer. The MRC framework was used for the development of interventions to improve health.15 In Phase 1, the problem was first defined with reference to the empirical evidence and underlying theory. Second, it was clarified how empirical evidence and underlying theory improves understanding of how the problem is sustained, and which mechanisms could overcome the problem. Lung cancer is the commonest cause of cancer death in Scotland and is usually diagnosed at an advanced stage when cure is not possible. Previous research indicates that most people with lung cancer have experienced symptoms and many wait for a long time before consulting their GP. It seems plausible that encouraging people at high risk of lung cancer to consult earlier with potential lung cancer symptoms will result in more people diagnosed early at a potentially curative stage. This study has developed and refined a theory-based intervention incorporating behaviour change techniques which has the potential to prompt earlier consultation in symptomatic patients at high risk of lung cancer. Phase 1 progressed through five sequential steps led by an expert multidisciplinary group comprising two psychologists, a sociologist, three GPs, a respiratory physician, and a health services researcher. The group had two formal meetings and also worked iteratively on the draft intervention via smaller meetings between members and e-mail contact. The group’s work is summarised in Table 1. In Step 1, the group defined and quantified the essential underlying problem as patient behaviour leading to the late presentation of lung cancer symptoms. In Step 2, they identified the target group most likely to benefit from an intervention as people aged ≥55 years, with a history of 20 pack years or more, who are current smokers or gave up within the past 10 years. In Step 3, the key concepts underlying the causative and sustaining pathways of a delayed lung cancer diagnosis were elucidated. The most informative behavioural and social models from health psychology (for example, the Illness Action Model, Theory of Planned Behaviour, Zola’s triggers: see Table 2) to address each concept were identified. These were then used to develop the construct encapsulating the way in which the concept caused or sustained late diagnosis. This was further mapped on to evidence that supported the theory (Table 2). In Step 4, theory and evidence were mapped on to concrete behaviour change techniques (such as goal setting, action planning, and prompts/cues: see Table 3) to positively impact on the causative and sustaining pathways (Table 3). In Step 5, the potential benefit of the intervention was quantified (Table 1). Also accomplished within Step 5 was the synthesis of identified techniques into the first draft of the intervention (Figure 1). In summary, it comprised a nurse consultation (which included physical examination and spirometry) in which the patient was introduced to a home-based self-help manual providing information and behaviour change techniques, and was guided in making ‘if–then’ action and coping plans. The consultation and self-help manual sought to increase the salience and personal relevance of chest symptoms, introduce chest disease prototypes, reinforce the benefits of early intervention in lung cancer and other chest disease, sanction early consultation, tackle barriers to consultation, and develop good personalised action and coping plans. To optimise the intervention the study explored its implementation in focus groups with GPs, high-risk patients, and patients with lung cancer. People at high risk of lung cancer (smokers and ex-smokers with and without lung disease, non-smokers with lung disease) and partners of smokers were recruited through two general practices in Northeast Scotland and the Aberdeen British Lung Foundation’s Breath Easy Group. Patients with lung cancer were recruited with assistance from the specialist lung cancer nurses at Aberdeen Royal Infirmary. GPs were approached through the Grampian teaching practices group. Two focus groups were conducted, one for high-risk patients at a community location (with seven participants), and one for GPs at a health centre in Aberdeen (four participants). Six individual interviews were conducted with patients with lung cancer, mostly in their own homes. In two cases, spouses/partners stayed for the interview. During focus groups, practice meetings, and interviews, participants were presented with a summary of the intervention. The study explored positive and negative responses, perceived consequences, methods of implementation, barriers and facilitators to implementation, methods to optimise attendance, and possible solutions to negative consequences and barriers. Focus groups and interviews were audiotaped and transcribed. Notes were taken during practice meetings. Data were analysed inductively, to identify unanticipated themes, and deductively, to identify problems with and barriers to the intervention as well as possible solutions. General comments were positive, such as ‘Excellent idea, it’s got to be done, but a tall task’ (lung cancer patient). 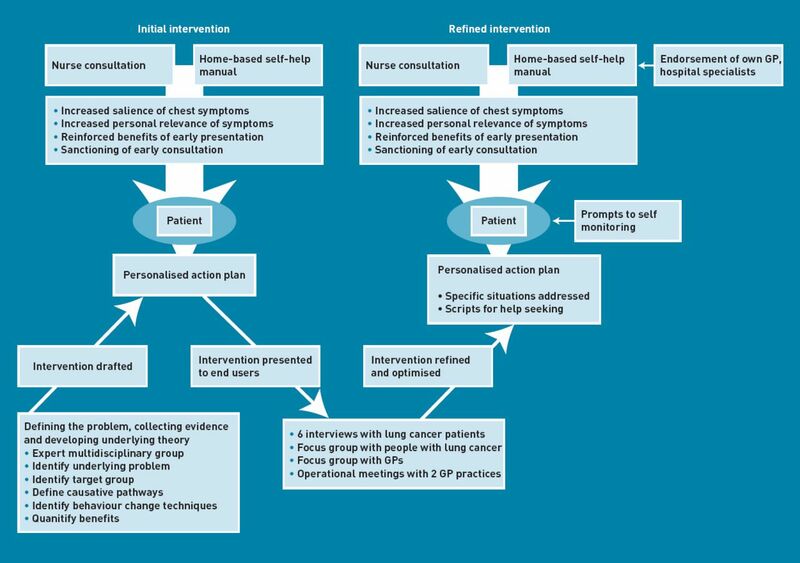 Most comments about problems for the intervention could be grouped into three main themes: engaging patients; achieving behavioural change; and the patient–general practice interface. The GPs commented that many in this group ‘don’t listen to advice’. ‘Sell, sell, sell —“nip lung disease in the bud”’, ‘the hard sell has got to be there, [with] impact on the front page.’ (high-risk group). On the other hand, there were concerns that it may also be counter-productive and that people ‘may be too scared’ (lung cancer group). ‘What they are going to be doing is being scared, if they get symptoms they will ignore it’ (high-risk group). One strategy suggested by GPs was to tie the intervention in with something else (for example COPD reviews). This was based on previous experience of attempting to implement similar interventions opportunistically on hard-to-reach groups. ‘Support is important — it’s surprising the number of people that have been really worried about something far worse … they need support to go and get the diagnosis.’ (high-risk group). There was encouragement from the high-risk group for participants to bring a family member, partner, or close friend along to be involved in the intervention. This was also advocated by the GP group, with the proviso that the possibility of conflict between the family member or friend and the participant should be looked for and avoided, as this could be counter-productive. Ideas from both patients and GPs were put forward as a means to prompt self-monitoring of symptoms included calendars, text messaging, postcards, and Post-it ® notes, but with a need for plans to be tailored to individuals. GPs suggested prompts on cigarette lighters so patients were prompted to think about their symptoms ‘every time you light up’. There were several specific recommendations for the self-help manual from both the high-risk group and lung cancer patients. These included keeping it simple, emphasising symptoms are not ‘just because you are older’, provision of a helpline, a sprinkling of benefit messages throughout, and quotes from people who have been through it. Finally, GPs advocated sending the booklet to non-attenders anyway, backed up by telephone calls if possible. Participants from all groups mentioned potential problems at the patient–general practice interface and made clear that they felt this was a very important part of the explanation for late presentation. The high-risk group was worried that GPs had a negative attitude towards smokers and one said ‘I just think GPs don’t really know [about lung disease].’ There was a need for confidence that GPs would take them seriously. ‘Smokers are beginning to think now wait a minute, are they going to treat me because I am a smoker?’ Patients with lung cancer spoke of the difficulty people can have making appointments: ‘Those who live alone or those who are short of cash … may need help to make appointments … to go to the appointments.’ GPs were concerned that the advice in the booklet should be consistent with what was achievable and not foster expectations that could not be met in practice. ‘If recruiting through GP practices, you have got to involve the whole care team — receptionists, doctors, nurses.’ (patient with lung cancer). ‘Everybody has got to be involved: the GPs, the consultants, the hospitals themselves.’ (patient with lung cancer). Patients with lung cancer felt that advice should be provided on making appointments and exactly what to ask when contacting their general practice. Care was needed to ensure that this wording was in line with what could be implemented in the trial practices. Similarly, but more generally, the wording of recommendations in the booklet should avoid friction between patients and GPs. Using the identified barriers to generate action and coping plans. Including messages to sanction and encourage appropriate consultation. Demonstrating approval of GPs, respiratory physicians, and oncologists for the process. Providing action plans and prompts (Post-its, postcards, or text messages) for self-monitoring. Giving specific advice on what to say when making appointments. Finally, in two meetings with general practices that had agreed to pilot the intervention, meetings were held with representatives of all staff. These were used to identify potential barriers at the patient–general practice interface and to ensure that the intervention was practically deliverable within these practices. Efforts were also made to minimise the work and disruption for general practices. This required some very minor refinements to account for differences in practice administration systems. None of these changed the final intervention in any material way. Referring to a range of lung disease, not only cancer. Proposing ‘special attention’ rather than fear message. Endorsement by Liz Dawn, best known for her role as Vera Duckworth in Coronation Street, who has emphysema. Messages to sanction and encourage consultation with chest symptoms from Liz Dawn, local specialists in respiratory medicine and oncology, participants’ GPs, and others with chest disease. Stories and speech bubble messages from patients about early and late consultation. Frequent messages about the benefits of early consultation. A simple checklist of symptoms that need action and when. Prompts to self-monitoring — monthly postcards, texts, or stickers — to themselves and close others. If–then action and coping plans based on identified barriers to consultation. Specific advice on what to say and expect when making appointments. 1,2,3 action plan logo repeated throughout the manual. The nurse consultation was based on a script produced primarily by the lead health psychologist, the lead research nurse, and the health services researcher for the project. The basis for the script was the intervention self-help manual. The research nurses were advised on what to say as they talked through the manual with the patient. Research nurse training took place over 2 separate days and included nurses simulating consultations with a member of the multidisciplinary team. The manual was coded independently using a taxonomy of 84 behaviour change techniques to identify the precise techniques used in the intervention. 37 Where there were disagreements about the presence of a technique, discussion followed until agreement was reached. The twelve techniques included in the manual are given in Table 3, with examples, including prompts/cues, action planning, and goal setting. This study describes the development of an intervention that is feasible and acceptable to potential recipients, and worthy of further evaluation. The experience gathered in this intervention developmental process has clear implications for others seeking to develop similar interventions. First, considerable care and thought should be expended in the formation of any multidisciplinary group tasked with devising an intervention such as this. The apparent success of the study’s developmental process, it is believed, was based in large part on the sound theoretical underpinning of the intervention elements, which, at the same time, was tempered with the practical experience and insights of clinicians used to working with these patient groups. Second, the theoretical development of the intervention was iterative, with much discussion, questioning, and refinement of individual components before they developed a concrete form. This ensured shared understanding amongst the multidisciplinary group, which was an essential prerequisite for further refinement once the perspectives of end-users were available. Third, once the intervention had been devised, rather than proceeding directly to a pilot exercise that would have required considerable resources, the study explored the theoretical intervention in focus groups with GPs, high-risk patients, and patients with lung cancer, essentially the end-users of the intervention. As a result, the study was able to effect several refinements that are believed to be likely to improve the intervention. The authors suggest that such exploratory piloting may be a more efficient and cost-effective approach than moving straight to a potentially costly practical pilot exercise. Furthermore, the authors believe that this approach provides a template for others wishing to develop complex healthcare interventions. This study describes the development of an intervention underpinned by evidence, theory, and context, and with care taken over wording, presentation, and delivery. Although apparently comprising separate phases, the process was iterative. There was much refining and revising of ideas before the first draft of the intervention emerged, and once the data from focus groups and interviews had been analysed, the expert group was again able to contribute to the fine tuning of the intervention. An iterative process in intervention development has been used and recommended previously by the researchers.38 Full engagement of a multidisciplinary team with both theoretical and clinical expertise helped to ensure the intervention was grounded both theoretically and in its context of delivery. Formal consultations (qualitative research) with patients and professionals allowed many of the potential strengths and weaknesses of the intervention to be identified, confirmed, and addressed before it was rolled out to patients. Preparatory work with general practices ensured that the potential barriers faced by patients in securing a GP appointment were taken into account. Care was taken to ensure the intervention was attractive and wording was both easy to read and consistent with underlying theory and evidence. Training in delivery with a clear plan for the way the work of the intervention is actually done by the nurses in the consultations, developed with involvement of the nurses themselves, and supported by a training programme. This should help to ensure fidelity in delivery.39 Finally, the specification of the active behaviour change techniques and of the mode of delivery makes it more likely that the intervention is replicable by different investigators as per the WIDER Recommendations to Improve Reporting of the Content of Behaviour Change Interventions.40 A further strength worth highlighting is that the detailed development methods presented here could form a template or structure for others developing complex interventions. The processes engaged in that added strength to the intervention are summarised in Box 1. Full engagement of multidisciplinary team with both theoretical expertise and clinical expertise in general practice, secondary care of chest problems, and behaviour change. An iterative process where each stage built on previous stages. Use of evidence about patterns of consultation and delay in lung cancer. A theoretical basis that drew on a range of disciplines including primary care, sociology, and health psychology. Use of well-specified active ingredients of behaviour change (behaviour change techniques). Developing a workbook with good readability and attractiveness. Preparatory work with the general practices involved. Development of a clear plan for the work done by the nurses in the consultations with patients. Training of the nurses conducting the consultations. Replicable intervention based on specified behaviour change techniques, mode of delivery, self-help manual, and training script for the person delivering the intervention. This intervention has been carefully designed to accord with the ideas, concerns, and expectations of patients and health professionals in Northeast Scotland. It has a mechanism of action that has the theoretical potential for benefit. Now it requires evaluation. Grateful thanks to the interested patients and GPs who took part in the interviews and focus groups. Thanks also to Michael Head, Chairperson of the British Lung Foundation’s Breath Easy Group, who helped recruit patients for intervention development. Grateful thanks also to the staff at the general practices involved in the study, particularly Dr Peter Watson and Dr Iain Small, who provided practical advice on the intervention as it developed. The study was funded by a project grant from Cancer Research UK. CRUK Grant Reference Number C542/A8695. Full ethical approval for the study was granted by the North of Scotland Research Ethics Committee (REC reference number: 08/S0801/13) on February 15 2008. All authors have completed the Unified Competing Interest form at www.icmje.org/coi_disclosure.pdf (available on request from the corresponding author) and declare that: 1) none of the authors has support from any commercial company for the submitted work; 2) SS, PM, GD, MJ, AL, UM, MN, RP, SW, and NC have no relationships with any commercial company that might have an interest in the submitted work in the previous 3 years; 3) their spouses, partners, or children have no financial relationships that may be relevant to the submitted work; and 4) SS, PM, GD, MJ, AL, UM, MN, RP, SW, LR and NC have no non-financial interests that may be relevant to the submitted work. Revision received April 3, 2012. (2010) Estimates of worldwide burden of cancer in 2008: GLOBOCAN 2008. Int J Cancer 127(12):2893–2917. Lung cancer: UK incidence statistics, http://info.cancerresearchuk.org/cancerstats/types/lung/incidence/ (accessed 30 Jul 2012). Cancer statistics: lung cancer and mesothelioma, http://isdscotland.org/Health-Topics/Cancer/Cancer-Statistics/Lung-Cancer-and-Mesothelioma/ (accessed 30 Jul 2012). Lung cancer: survival statistics, http://info.cancerresearchuk.org/cancerstats/types/lung/survival/ (accessed 30 Jul 2012). , eds (2006) SEER cancer statistics review, 1975–2003 (National Cancer Institute, Bethesda, MD). (2007) Survival for eight major cancers and all cancers combined for European adults diagnosed in 1995–99: results of the EUROCARE 4 study. Lancet Oncol 8(9):773–783. (2001) Cancer scenarios: an aid to planning cancer services in Scotland in the next decade (Scottish Executive, Edinburgh). (2002) Impact of delay on diagnosis and treatment of primary lung cancer. Acta Ontol 41(2):147–152. (2005) The diagnosis and treatment of lung cancer (National Collaborating Centre for Acute Care, London). (2005) Management of lung cancer (SIGN, Edinburgh). (2007) Lung cancer plan: improving lung cancer survival in the UK (UKLCC, London). (2008) Developing and evaluating complex interventions: the new Medical Research Council guidance. BMJ 337:a1655. (2009) Risk factors for delayed presentation and referral of symptomatic cancer: evidence for common cancers. Br J Cancer 101(Suppl 2):S92–101. (2002) Tobacco smoke and involuntary smoking. IARC Monographs on the Evaluation of Carcinogenic Risks to Humans Volume 83 (World Health Organization, Lyon). (2005) Lung cancer screening. N Engl J Med 352(26):2714–2720. (2004) Lung cancer screening, www.ahrq.gov/clinic/uspstf/uspslung.htm (accessed 30 Jul 2012). (2005) Elevated lung cancer risk shortly after smoking cessation: is it due to a reduction of endotoxin exposure? Med Hypotheses 65(3):534–541. (1973) Pathways to the doctor: from person to patient. Soc Sci Med 7(9):677–689. (1977) Self-efficacy: toward a unifying theory of behavioural change. Psychol Rev 84(2):191–215. (1980) in Contributions to medical psychology, The commonsense representations of illness danger, ed Rachman S (Pergamon Press, New York, NY), vol 2. (1986) Illness representations: a prototype approach. Health Psychol 5(2):95–114. (1995) Delay in seeking a cancer diagnosis: delay stages and psychophysiological comparison processes. Br J Soc Psychol 34(Pt 1):33–52. (2001) Cardiff papers in qualitative research, Aspects of illness (Ashgate, Burlington, VT), 2nd edn. (2002) The role of social networks in health, illness, disease and healing: the accepting present, the forgotten past, and the dangerous potential for a complacent future. Soc Networks Health 8:3–25. (1985) in Action control: from cognitions to behavior, From intention to actions: a theory of planned behavior, eds Kuhl J, Beckman J (Springer-Verlag, New York, NY). (1991) The theory of planned behavior. Organ Behav Hum Dec 50(1):79–211. (1999) Implementation intentions: strong effects of simple plans. Am Psychol 54(7):493–503. (2004) Factors influencing patient and primary care delay in the diagnosis of cancer: a database of existing research and its implications for future practice. Final report to the Department of Health (Ref 1217522) (University of Glasgow, Glasgow). (2005) Is late diagnosis of lung cancer inevitable? Interview study of patients' recollection of symptoms before diagnosis. Thorax 60(4):314–319. (2001) A qualitative study on detecting cancer symptoms and seeking medical help; an application of Andersen's model of total patient delay. Patient Educ Couns 42(2):145–157. (2008) From theory to intervention: mapping theoretically derived behavioural determinants to behaviour change techniques. Appl Psychol-Int R 57:660–680. (2008) A taxonomy of behavior change techniques used in interventions. Health Psychol 27:379–387. (2007) Designing an integrated follow-up programme for people treated for cutaneous malignant melanoma: a practical application of the MRC framework for the design and evaluation of complex interventions to improve health. Fam Pract 24(3):283–292. (2008) Fidelity of delivery of a physical activity intervention: predictors and consequences. Psychol Health 23:11–24. (2009) WIDER recommendations to improve reporting of the content of behaviour change interventions, http://interventiondesign.co.uk/wp-content/uploads/2009/02/wider-recommendations.pdf (accessed 30 Jul 2012). (2011) Strengthening evaluation and implementation by specifying components of behaviour change interventions: a study protocol. Implement Sci 6:10. (2005) Making psychological theory useful for implementing evidence based practice: a consensus approach. Qual Saf Health Care 4(1):26–33.